So, can't afford real Ferrari F430 yet? 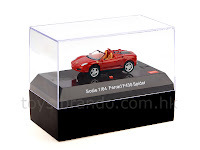 Well you can probably afford this one: Rechargeable Desktop Mini R/C Ferrari F430 Spider Set. This is a perfect gift for Ferrari collectors, kids, teens, R/C collectors, or any gadget fanatics. The Mini R/C Ferrari F430 is an official licensed Ferrari product and is about 7 cm long, and weighs 20 grams. It comes with a transparent collector display box if you just want it displayed on your desk. The Mini R/C Ferrari F430 has a control distance of about 10M. The Mini R/C Ferrari F430 costs about $27.90 at Brando.com.